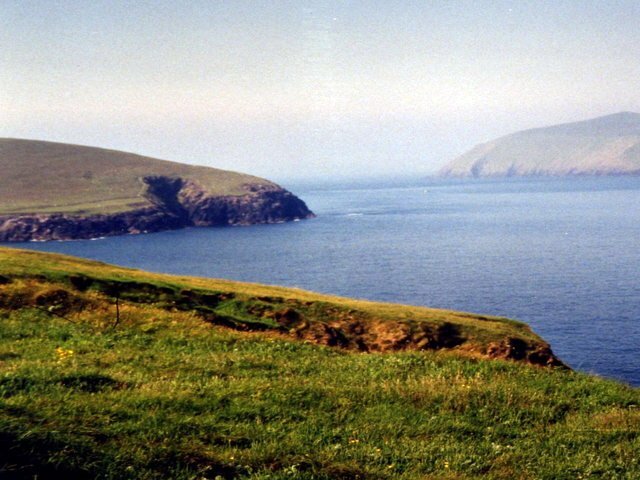 Wine Strand is located on the most westerly point of Ireland's spectacular Dingle Peninsula, in Co. Kerry. The Atlantic coast makes a beautiful location for a memorable Irish holiday vacation. With golf, angling, diving, hill-walking, cycling and beautiful beaches, Wine Strand near Ballyferriter, has it all! Experience it for yourself. Here is a beautiful article I found in “Irelands Own”, about Wine Strand. IT WAS HARD to believe it was November the day so mild and bright the sea so marvellously green and blue And yet for all that the surf was pounding on the shore churning up the sand and fillmg the place with its sonorous boom. The gulls near the shore rose and fell with the incoming tide indifferent as they were to the glittering swell all around them Further out the spray was curling and flashing and foaming round the dark rocks, great cascades of it rising high, then falling down and down again. It was the most perfect of seascapes, the most magical too, full of the noise and grandeur of the sea and yet full of solitude still. It was a scene that might have graced the canvass of many an old master the sky overhead a wild and whimsical blue that had the look of summer days about it. It was strange to think of dark November so wild and bright and beautiful it was almost as if someone imagined it wished it to life in a single moment As we drove westwards, we had seen the last of the fuchsia bells shining in the hedges, a woman by the wayside picking montbretia, further evidence of the mildness of the I season. There were trawlers by the pier in Dingle and gulls soaring overhead and here we were at last on the Wine Strand, Tra an Fhiona to give it its Irish name, a name that has a wonderfully lyrical ring to it, evoking echoes of the magical and the mythical too. IT WAS LOVELY just to stand and watch, the splendour of the foam spilling over the dark rocks the laughing calls of the gulls adding their own touch of magic still. There weren’t just herring gulls though the familiar faoilean in Irish but great black backed gulls too. The latter, known in Irish as Droimneach mor is in fact our largest gull the adult readily identified by its white body, black wings and back. The massive yellow bill is conspicuous even from a distance as are the pink legs. The call is deep and guttural and is wonderfully evocative of the sea and the shore and the lonely skies The beat of the wings is rhythmic and slow, at least when compared to that of its relatives, but there are long periods of gliding too, effortless gliding overhead, and a truly spectacular sight above the broad expanse of the sea. Its name in Latin is Larus maritimus, a’ name which clearly shows that it is largely a maritime species; the nest in the breeding sëãson sometimes perched at the tip of some rocky pinnacle. There are many who do not like the species for its predatory nature but the bird at its gliding is the very essence of the sea As the author of one old bird book puts it ‘Its flight is graceful and powerful exhibiting as it does superb aerial control. The same writer observed that despite its reputation the great black backed gull often lives in perfect harmony with species such as the Oystercatcher. There were plenty of Oystercatchers too on the Wine Strand on that glorious Novembers Day their black and white plumage and orange bills making them unmistakable. IT WAS a great adventure, a great day out for our two black Labradors, of course It might have been November but they went running with the sun and the sea, leaving their footprints behind on the warm sands. It was as if they were full of the life and vigour of the sea the sea air wild and bright and bracing filling them up with delight. We were not the only ones on the strand that day. There were a few others but the sense of peace and quiet was palpable still Even the fields beyond had a greenness and lushness about them that seemed not to believe that it was winter at all the sheep at their ease at their grazing. I could not resist the impulse to pick up a shell now and then and look at its colours and staining I picked up a few pebbles too some marvellously white others the richest of reds all washed smooth by the power of the sea. When we were getting ready to leave, I put a few pebbles in my pocket, souvenirs of our wonderful day and our visit to the wine strand. All the way home my head was full of pictures of the sea, the gulls and the rocks and the Wild surf breaking on the shore. I knew that the memory of it would stay with me a very long time.